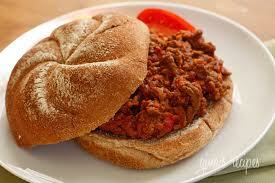 Say goodbye to canned sloppy joe mix! Brown turkey, onion, and garlic in a large saute pan. In Crock-pot combine browned turkey and all ingredients. Serve on toasted whole wheat buns.